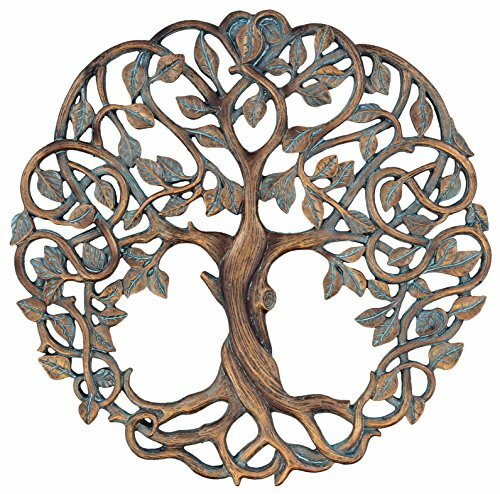 Decorate your favorite wall with this beautifully detailed Tree of Life plaque from Old River Outdoors. Features a rustic copper and verdigris finish. Made from hard / durable poly-resin material with amazing details. Metal hanger on back for easy, secure mounting. Measures approximately 11 5/8" dia. Metal hanger on back for easy, secure mounting. Beautiful copper / verdigris finish. Made from poly-resin material - no sharp edges, will not rust! If you have any questions about this product by Old River Outdoors, contact us by completing and submitting the form below. If you are looking for a specif part number, please include it with your message.